This is a restoration by Peter Thompson with the Anzani engine. Mine, alas, was a humble utilitarian model, not the spiffy sports version of the picture. I owned mine around 1931 or so, but it was quite elderly by then. This was a transitional move between motorcycles and autos. The cost of the license reflected this, being half way between what you paid for a motorcycle and a full blown car. Morgan never built their own engines and used a variety of proprietary ones: JAP (for J.A.Prestwich), the most frequently used; Blackburn, a very potent one; Anzani, who made aircraft engines during WW 1; these were all V twins. Later, they used Austin 4s. 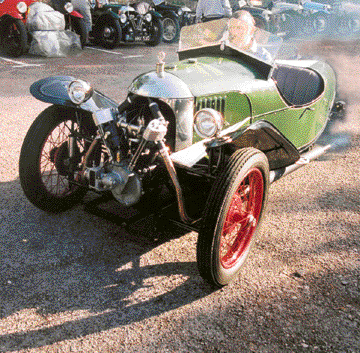 Now, in the era of the Morgan 4-wheeler, they appear to be using Ford and Rover 4 cylinder engines. The Morgan had only two gears, with no reverse, so one avoided downhill cul-de-sacs. it had a large folding hood (ragtop to you) something like the contemporary baby carriage. The top was a good bit taller than the windshield so it tended to scoop down the rain on the occupants. Starting was by a large crank handle applied to the side of the car. It always looked like someone winding up a toy. Often, when it fired unexpectedly after a lusty crank, one's momentum caused one to smite the road. You could tell a Morgan driver by looking for his skinned right knuckles. Further Morgan information here: Morgan 3-Wheeler. 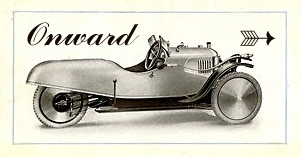 That's where the Editor got the image of the 1924 Aero for the forward button, below.